Liebenhaut Coaches Trial Team to Championship. Tallahassee — For a second year in a row, the Florida State University College of Law Mock Trial Team has won first place in the E. Earle Zehmer Memorial Mock Trial Competition. 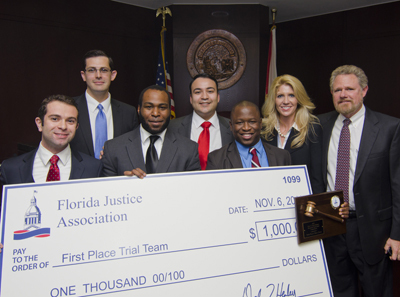 The 2011 competition, hosted by the Florida Justice Association Young Lawyers Section, was held in Tampa on November 5-6. Winning team members are third-year students Raul Arispe (of Los Angeles, California) and Marshawn Griffin (of Pensacola, Florida) and second-year students Joey Chindamo (of Longwood, Florida) and Jennito Simon (of Pompano Beach, Florida). They were coached by Tallahassee attorneys Dana Brooks and Matt Liebenhaut.